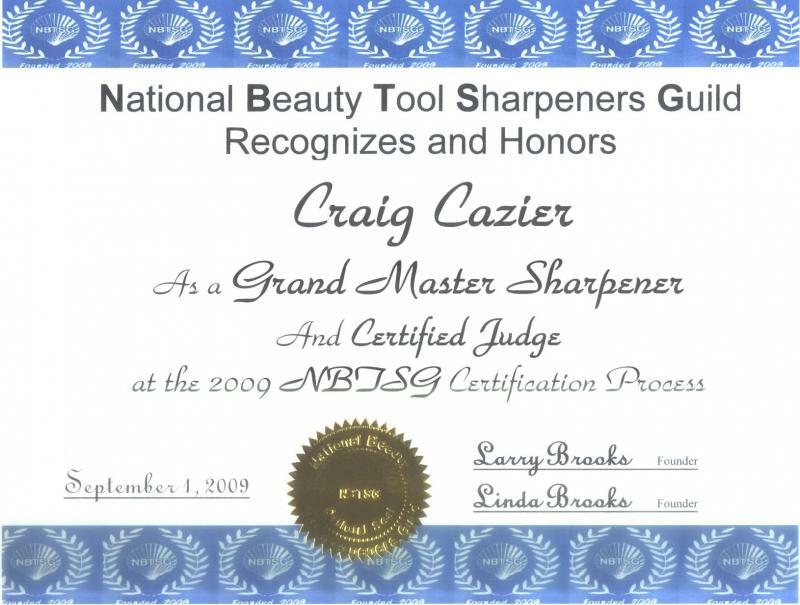 NBTSG Certificate - Precision Sharpening Inc. The NBTSG certification test is done with two pair of severely damaged shears and a severely damaged thinner. The shears, one convex honed and one bevel edge, have been bent, dulled, nicked, and parts removed, the thinner has also been severely damaged and dulled. The entrant has 120 minutes to repair and sharpen all three shears to as near new condition as possible. Another test is performed on clipper blades where the entrant has to repair and sharpen 3 severely damaged and dulled clipper blades all of different sizes and the entrant has 45 minutes to repair and sharpen these blades to as near new condition as possible. These tests are not easy and the organization certainly does not just train sharpeners and issue a certificate saying you are a sharpener. The judges (at least 3) are all Grand Master Sharpeners making the judging team a well rounded group of industry professionals. These tests are the ultimate test of a sharpeners skill and IF you pass the test you truly do know how to sharpen scissors and/or clipper blades. If you visit the NBTSG web site you will see that there are not a large number of guild members listed. Guild Member Apprentice: This is a sharpener that did not achieve their goal as a Guild member in the fields chosen, but will be recognized as a Guild Member Apprentice. Guild Member: Is a sharpener that has achieved status in the fields chosen. Master Sharpener Guild Member: Is a sharpener that has achieved Master Sharpener status in each of the field's chosen. Grand Master Sharpener Guild Member: Has achieved Master Sharpener status in all of the fields offered.